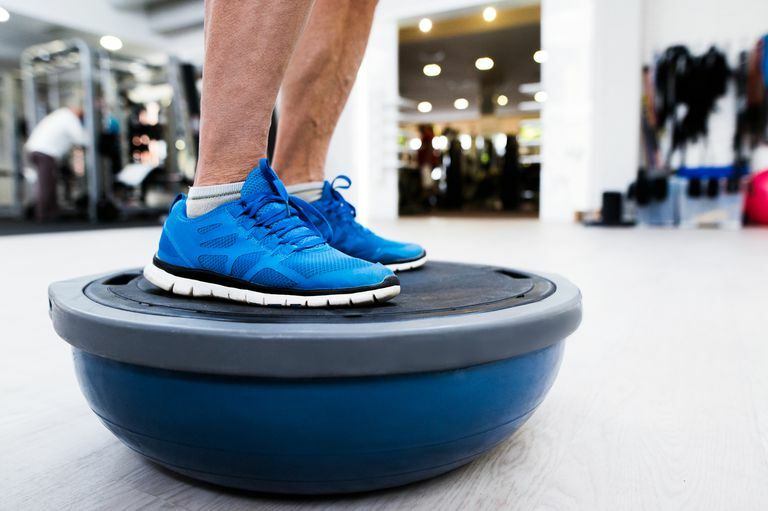 The BOSU Balance Trainer is one of the more exciting exercise tools to hit the fitness world in the past few years, quickly becoming a staple in many health clubs and home gyms. It's perfect for targeting multiple areas of fitness like endurance, strength, balance, and stability. The squishy dome side on top offers a bouncy surface for everything from cardio to strength training. Flip it over and there's a flat side you can use for core work, lower body exercises or flexibility training. Cardio: Use it for short bursts of cardio such as side lunges, plyo-lunges, over the top squat jumps, and more. You can also use it as a step for choreographed workouts. Strength training: Add a whole new challenge to your strength workouts with moves like squats with an overhead press, lunges with biceps curls or pushups. You can even use it as a weight bench to add a balance challenge during traditional weight work like chest presses. Flexibility: Stand or kneel on the dome while doing traditional stretches like hamstring stretches or hip flexor stretches. This also adds instability to the exercise, so you should practice these while standing next to a wall until you get used to it. Sports Conditioning: Use it to perform sports drills, like jumping or plyometric movies like side leaps to increase performance and agility. Core training: Use it for abdominal exercises like dead bug and v-sits or for lower back exercises, such as back extensions, to target the core muscles. Doing exercises on the Balance Trainer requires you to maintain your center of gravity over a surface that is constantly changing. Just standing on it is challenging, as your body moves and shifts into and out of balance. Balance: Because the BOSU is never stable, you're constantly engaging the small stabilizer muscles in the upper and lower body to keep you in place. Kinesthetic awareness: This is just a fancy word for your awareness of how the body is positioned at any given moment. This awareness is something that often declines as we age, so the Balance Trainer can help you stay connected with how your body moves. Proprioception: This is another fancy word describing how your body responds to external forces to keep your joints in the right position. When you stand on a Balance Trainer, all of your muscles are forced to contract to keep your joints in proper position. This helps to make normal activities easier. The best thing about the BOSU, besides its versatility, is that it adds fun to your usual workouts. You can use it in place of a step for aerobic workouts (very tough) and while doing some traditional yoga poses, like warrior and triangle. It made the workouts challenging and interesting. The BOSU Balance Trainer is available at a variety of sporting goods and departments stores and online. You can also find detailed exercises and other BOSU products at BOSU.com. Rob Glick's Cardio Fusion: This 45-minute cardio routine offers a choreographed workout very similar to a traditional step routine. The workout is a bit dance-like but also includes sports-like moves as well. This is a great introduction to cardio on the Balance Trainer. BOSU Equilibrium with Jay Blahnik: This excellent DVD offers a great yoga/Pilates type workout that can be both challenging and relaxing. Jay does some traditional yoga moves (like warriors and sun salutations) using the Balance Trainer and also includes some core work as well. You can view more BOSU training DVDs at BOSU's site. The Balance Trainer is a great addition to any home gym, offering a variety of activities and exercises to push you past your comfort zone. If you're looking for something new, the Balance Trainer just might fit the bill. You can try beginner-friendly exercises to get started.